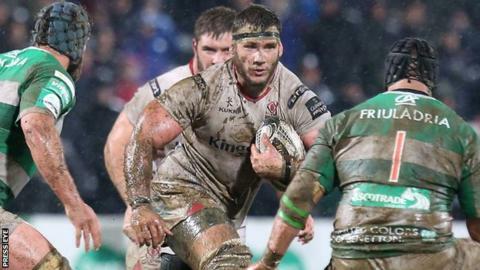 Marcell Coetzee's knee injury is not as serious as initially feared although a cartilage tear will sideline the Ulster back row for four months. It was feared Coetzee had ruptured his anterior cruciate ligament for a second time but he will now be fit and available for the start of next season. The South African was injured in the win over Zebre earlier this month. "It really is fantastic news - I think most people were fearing the worst," said Ulster director of rugby Les Kiss. The 25-year-old, who has been capped 28 times for the Springboks, made his Ulster debut against Edinburgh in February after missing the start of the campaign with an anterior cruciate ligament rupture. He had an immediate impact, registering an incredible 26 carries in a 59-minute appearance against the Scots. Coetzee also featured prominently in the subsequent wins over Glasgow and Treviso, before picking up the injury in the record ten-try Pro12 victory over Zebre. "He has had a tremendous impact since he joined the club, not only on the pitch, but also on the training paddock with his huge work ethic and infectious positive attitude," added Kiss. "It's a great boost for the club, the supporters and most importantly Marcell himself, that we will see him back in an Ulster jersey at the start of next season. "I have spoken to Marcell and he's really pleased with the prognosis. I know from the way he faced the challenge of his previous rehab that he will be back even better than before."